In a sudden reversal of fortune, Democrat extremism is putting President Trump and congressional Republicans on sound footing for the 2020 elections. Just a few months ago, Democrats were flying high after taking over the House of Representatives by making big strides with suburban voters, including key battleground states such as Pennsylvania. Part of the winning strategy for Democrats running in moderate districts was to distance themselves from then-House Minority Leader Nancy Pelosi, D-Calif., to counter Republican messaging that a vote for a Democrat was essentially a vote for a left-wing speaker of the House. Democrats understood that left-wing political extremism would not sell in swing districts, but now the discipline of the 2018 midterm election is being thrown out the window. The mask of moderation is being torn off, exposing Democrat extremism. Thanks to newly elected representatives and recently announced 2020 presidential candidates, lurching too far Left is branding Democrats as the political party supporting socialism. A Harvard CAPS/Harris Poll reported that 64 percent of registered voters believe the Democrat Party supports socialism. More concerning for Democrats, the poll also revealed 65 percent of the respondents backed a “mostly capitalistic” economic system, in contrast to 35 percent supporting a “mostly socialist” economic model. It gets worse for Democrats. An NBC News/Wall Street Journal poll reported only 18 percent of Americans view socialism positively. The poll also reported only 25 percent of respondents were “enthusiastic/comfortable” with a socialist candidate, in contrast to 72 percent who had “reservations/very uncomfortable” with a socialist running for president. The socialism label is extremely damaging to Democrats, and President Trump is using his communication skills and platform to drive the message home as part of the 2020 presidential race. 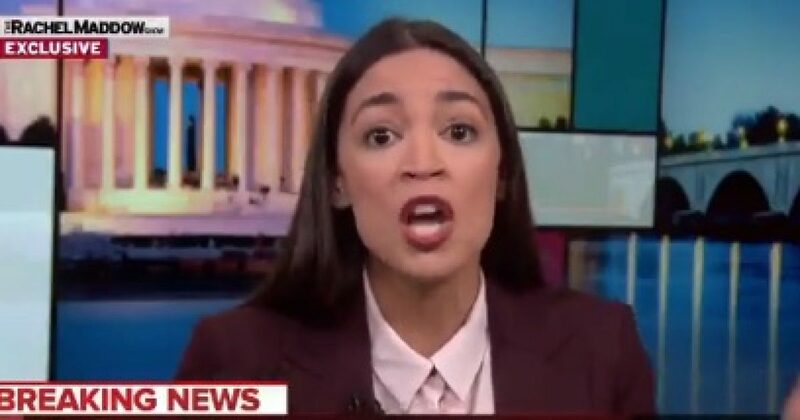 Democrats’ socialism is driven by media star freshman Rep. Alexandria Ocasio-Cortez, D-N.Y., who is advocating for taxing high-income Americans and pushing for government takeover of the economy under the cloak of addressing climate change through the Green New Deal. 2020 presidential hopefuls Sens. Elizabeth Warren, D-Mass., Kamala Harris, D-Calif., and the godfather of Democrat socialism, Bernie Sanders, I-Vt., are also calling for a huge expansion of government, ranging from Medicare for all to free college. Socialist branding is only part of the emerging problem for Democrats. The fight over illegal immigration, border security, and construction of the border wall is putting Democrats on the wrong side of safety and security, a core human value. For years, Democrats used the safety and security of Americans as justification for a range of environmental, food, and drug regulations, but during the President Trump era, that theme is cast aside. A Zogby Analytics Poll reported that suburban women, whom Republicans lost during the 2018 midterm elections, support the wall. The poll reported 45 percent of suburban women supported the construction of the border wall through other sources of funds beyond the amount provided by Congress, while 40 percent opposed the alternative funding approach. Extreme positions on immigration, such as defunding U.S. Immigration and Customs Enforcement (ICE), advocated by Ocasio-Cortez, her freshman colleague Rep. Rashida Tlaib, D-Mich., and Democrat 2020 presidential candidates, will alienate suburban women voters. The media’s attention to the Democrat freshmen and presidential candidates guarantee the extremist position on ICE will be widely covered by news outlets. Democrat calls to abolish ICE ignore the role the agents play in removing MS-13 gang members who threaten suburban communities. Finally, the latest information from U.S. Customs and Border Protection documents a surge of illegal crossings, with 66,400 arrests in February, the most for that month in almost a dozen years. In addition, Border Patrol agents have arrested 136,150 people in the last five months, more than the 107,212 arrested during government’s 2018 fiscal year. According to CBP Commissioner Kevin McAleenan, the wave of people swarming into the U.S. threatens to collapse the system. A Democrat platform of socialism and ignoring the crisis at the border is setting up a 2020 red wave.